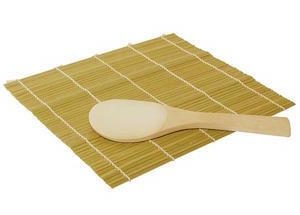 Our Bamboo Sushi Mat with bamboo sushi paddle is an excellent purchase for the home chef interested in learning how to make authentic rolled sushi at home. Add seaweed, Chinese sticky rice and any other filling you want, roll together into a log and then cut into 1" pieces. A great hors d'oeuvre or main dish, your guests will love it made fresh.